Prior to the word “superfood” perfectly embedding itself in our vocabulary after Dr. Steven Pratt coined the term in 2004, we didn’t have such a distinction when it came to the foods we ate. Fruits and vegetables have long been known to have health benefits and are a part of our daily diet — or at least they are supposed to be. However, we didn’t give them a greater nutritional value and consider that some may be better for our well-being than others. Still, generally speaking, nutritionists and dietitians more simply refer to superfoods as nutrient powerhouses that contain lots of polyphenols, vitamins, antioxidants and minerals. In addition, eating them serves a purpose: to prolong life, minimize your risk of chronic disease and help you to maintain a healthy weight. What Are Some Top Superfoods, and What Makes Them Special? Yogurt. We are learning more and more about how yogurt is good for digestive health, but this food, which is produced by bacterial fermentation of milk, is capable of so much more — it can strengthen your bones (even those associated with your spine), prevent high blood pressure and help you to recover after a workout. Think working out isn’t important in chiropractic care? Well, it is. Certain low-impact activities can improve mobility and flexibility — two consequences associated with many spinal injuries. Dark chocolate. Once considered a guilty pleasure, dark chocolate (with at least 70-percent cacao) has proven in later years to be an asset to our health. Packed with copper, fiber, iron, magnesium, potassium, zinc, manganese, phosphorus and selenium, dark chocolate can promote blood flow. Blood flow is crucial because our cells, nerves, joints, muscles and organs require it — and the oxygen they get from it — to function properly. This sweet treat can also reduce your risk of heart disease, lower your blood pressure and boost brain function. Onion. Let’s face it: Onions won’t win you any points in a fresh breath competition, but it can win you points with your chiropractor because it can decrease inflammation and strengthen your immune system. It may also lower your cholesterol and chance of developing heart disease. Pomegranate. This gorgeous fruit contains potassium, vitamin B6, polyphenols and ascorbic acid. What does this mean for your health? It means this softball-sized fruit can prevent abnormal platelet accumulation, lower your blood pressure and cholesterol, protect against osteoporosis, correct atherosclerotic plaque and boost your immune system. Berries. 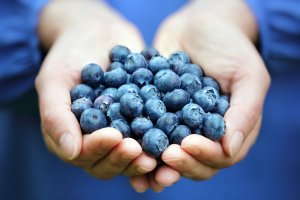 The next time you grab a handful of blueberries, consider that they contain nutrients such as ascorbic acid, folate, salicylic acid, vitamin E, carotenoids and polyphenols — all of which help with coordination and balance, brain function and cellular communications. They also help to prevent certain cancers and can slow down the signs of aging. Cinnamon. If you’ve had an injury stemming from a car accident, or are suffering from a condition like vertebral subluxation complex, you may have inflammation. Cinnamon has anti-inflammatory properties that can work with the treatment you receive from your chiropractor. Even better: It helps regulate glucose levels in those with diabetes, lowers cholesterol, boosts cognition and may reduce your risk of heart disease. All of these fares contain large concentrations of nutrients that are vital to our health, and they are low in calories. Low-calorie foods can aid in weight loss, which, if you are overweight, will ease pressure on the body’s joints / bones, lower blood pressure and improve heart health. A chiropractor can do much to resolve your physical ailments — within reason, of course — but when you add in superfoods that are packed with the vitamins and minerals needed to grow, repair, heal and sustain our body’s systems, cells, organs and skeleton, they allow treatment to work more effectively and may drastically reduce recovery time. Talk to your chiropractor about the benefits of combining superfoods with your treatment.